Picnic on a Rocky Coast, this Norman Rockwell painting, appeared on the cover of St. Nicholas published August 1918. This was the second picture by Rockwell to appear on the St. Nicholas cover. 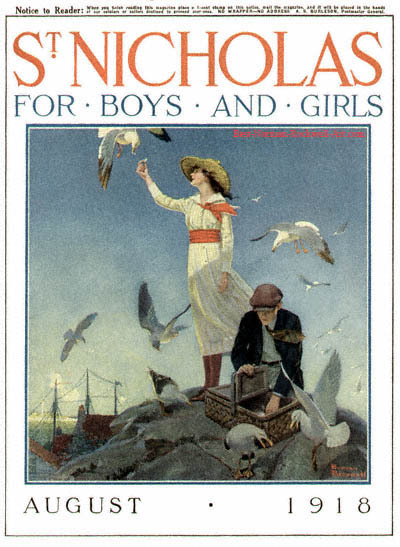 St. Nicholas only published three Rockwell illustrated covers, between 1916 and 1919. Published in 1918, during the First World War, this issue bears a notice to the reader. The notice, from the Postmaster General, tells the reader what to do when she is through with the issue. If she will affix a one-cent stamp to the magazine, it will be sent to American troops. This notice was standard on most magazines of the period. This painting is different from the scenes Rockwell is most famous for painting. Here we see two sweethearts packing up after a picnic. It looks as if this particular spot actually belongs to the seagulls. Watch your step! The girl is feeding bread scraps to one of the seagulls. Two others in the foreground look as if they are soon to fight over any leftover morsels that may slip from the picnic basket. The coastal wind is evident from both the boy's necktie and the girl's scarf. The gulls are flying against the wind also. My interpretation of this scene is that the couple have been enjoying a picnic and each other's company all afternoon. Notice the shadow across the girl's dress and the whole bottom of the painting. This suggests to me that the sun is starting to set. Now it is time to go home. Rockwell's attention to fine detail can really be seen when examining the background of this painting. First we see rooftops, then the masts of a tall sailing ship and finally the beach and lighthouse on the other side of the cover .